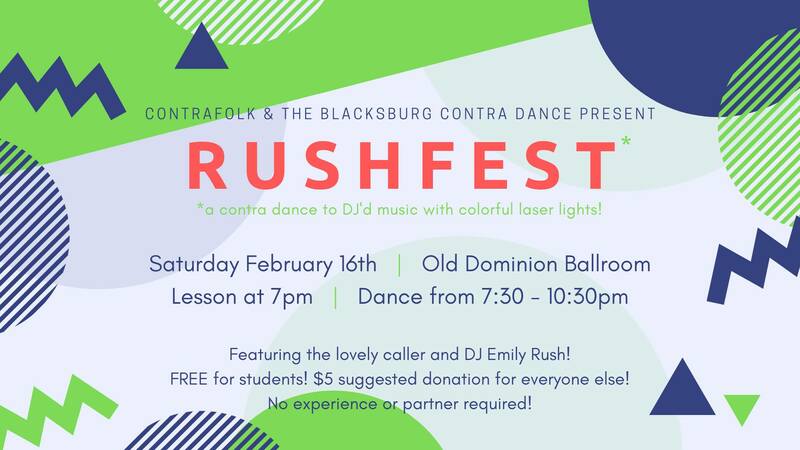 ContraFolk at Virginia Tech and Blacksburg Contra Dance combine forces to present the Rushfest Contra Dance on Saturday, February 16, 2019 at the Old Dominion Ballroom at the Squires Student Center on the campus of Virginia Tech. Rushfest is a contra dance to DJ'd music with colorful laser lights! Expect to hear all kinds of music including pop, rock 'n roll, tango, oldies, jazz. DJ music and calling will both be provided by Emily Rush. Contra is a form of community folk dance made up of long lines of couples dancing in sequence. A contra dancer gets to dance with their partner and everyone else in their line! Each individual dance is taught and called by a 'caller' with music provided by a live band or DJ. Admission is free for students and there is a $5.00 suggested donation for everyone else. Beginners, experts, students, locals, out-of-towners and all are welcome. Parking will be available in the Squire Student Center Lot or the Architecture Annex Lot and is free after 5:00 pm. To view the event flyer, visit: https://i.imgur.com/Uoq6DI3.jpg. For more information on the Blacksburg Contra Dance, visit: http://blacksburgcontradance.com/contradance.html or https://www.facebook.com/BlacksburgContra/. For more information on Contra Folk at Virginia Tech, visit: https://www.facebook.com/ContraFolkVT/ or https://gobblerconnect.vt.edu/organization/contrafolk.